NASA astronaut Ed White called it "the saddest moment of my life" when Mission Control ordered him back inside his Gemini 4 spacecraft after making America's first spacewalk on June 3, 1965. It may be the ultimate test for an astronaut: Six hours spacewalkingoutside the safety of a spaceship while wearing what is essentially a human-shapedballoon wrapped in layers of bulky insulation. But American astronauts havebeen spacewalking for 45 years, leaving their mark in orbit in the shape of agleaming $100 billion space station. 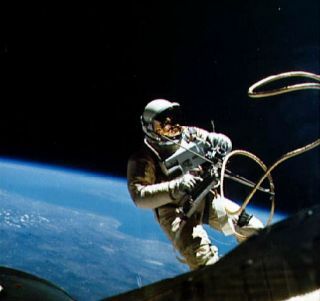 The firstAmerican spacewalk, performed by astronaut Ed White on June 3, 1965, lastedjust 23 minutes when he floated outside his Gemini 4 spacecraft while securedwith an umbilical cable. It came just months after the world's first spacewalk ?a harrowing 10-minute excursion ? by Soviet cosmonaut Alexei Leonov on March 18of that year. More than half of all spacewalksby NASA astronauts ? 146 of them ? have been aimed at building the spacestation, which is nearly complete after almost 12 years of orbitalconstruction. Astronauts also routinely work alongside Russian cosmonauts andspaceflyers from other countries to assemble and maintain the station. "It's a pretty phenomenal achievement when you think ofthe environment you're in and what the suit has to protect you against,"said astronaut Michael Lopez-Alegria, a 10-time spacewalker and NASA's reigningspacewalking champion. When construction began on the space station in 1998, NASAengineers and astronauts were daunted by what they called the "wall" ofspacewalks required to build the outpost, piece by piece, 220 miles (354 km) aboveEarth. Astronauts eventually had to tackle repairs never dreamed of by earlyspacewalk planners, like sewingtorn solar arrays back together and cleaning huge gummed up gears to keepthe orbiting lab in good shape. "We're able to do so much more now. It's amazing,"Lopez-Alegria told SPACE.com. "It's like comparing flying in an airplaneto a horse and cart." Lopez-Alegria has flown four space missions, three of them onNASA shuttle flights that included five spacewalks in all. His five otherspacewalks occurred while in command the International Space Station in 2006and 2007. To date, Lopez-Alegria has spent 67 hours and 10 minutes onspacewalks ? the most time of any American. "It's just been a privilege and an honor," he saidof his work on the space station, adding that he was in the right place at theright time to grab NASA's spacewalking title. "I think a lot of it has todo with pure luck." The world record for most spacewalks rests firmly withRussian cosmonaut Anatoly Solovyov (16 spacewalks over 82 hours and 22 minutes). To walk in space, American astronauts today wear a bulkywhite spacesuit called the Extravehicular Mobility Unit (EMU). Russia'scosmonauts use a different spacesuit, called Orlan, while China's spacewalkers useyet a third type named Feitian. A spacewalk, in NASA parlance, is known as an extravehicularactivity (EVA). The NASA spacesuit's exterior is covered in 17 layers of insulationand tough fabric to protect against punctures and the severe temperatures swingsin space, which range from 250 degrees Fahrenheit (121 Celsius) in sunlight tominus 250 F (minus 156 C) at night. "It's like being bundled up for winter in severallayers," said NASA engineer Glenn Lutz, manager of the EVA office at theagency's Johnson Space Center in Houston. ? The spacesuit's core is its hard upper torso ? the attachmentpoint for softer sections that form the arms and legs, as well as the lifesupport backpack. Completing the orbital ensemble are gloves and a glasshelmet, complete with video cameras, lights (for night work) and a visor toblock the sun's glare. There is even a 30-minute backup oxygen supply and anemergency jetpack powered by cold nitrogen gas in case an astronaut driftsloose from the station or space shuttle. But none of those backups have ever been called upon in anactual U.S. spacewalk, a fact Lutz attributes to prepared astronauts and theirexperienced instructors and support engineers. "I think we all understand how critical what we do isand the consequences of a failure on our parts to make sure to get theattention on the right things," Lutz said in an interview. Astronauts practice for walkingin space using virtual reality gear and a giant swimming pool at theJohnson Space Center, one big enough to fit life-size versions of a space shuttlepayload bay and major segments of the International Space Station, which islong as a football field. "They don?t bother painting the Earth on the floor ofthe pool or anything," Lopez-Alegria said. But since an astronaut practicesseveral hours for every one hour of planned spacewalking time, it's ampletraining. Unlike the spacesuits used on the Apollo moon landings, thecurrent spacesuits aren't designed for actual walking. They're only built forweightless work. "Today, if we were naming spacewalks we probably wouldn'tcall them spacewalks because you do not use your feet or your legs,"explained Robert Pearlman, editor ofcollectSPACE.com, an online publication for space history and artifactenthusiasts, and a SPACE.com contributor. "Your arms become yourmain means of getting around." And it's not always a comfy ride. Spacesuit shoulder joints don?tcompletely mesh with a human's range of arm motion, which can cause injuriesduring training simulations in the big pool, Lopez-Alegria said. James McBarron, a retired NASA engineer who worked onspacesuits from the early Mercury program through the shuttle era, said some astronautsalso suffered from finger and fingernail injuries while preparing for spacewalks. "They liked the gloves to be extremely tight,"McBarron told SPACE.com. And then there are the views. The sight of Earthfrom space through nothing but a spacesuit helmet was tremendous to White,who later said Mission Control's order to end the spacewalk was the"saddest moment of my life." Lopez-Alegria agreed. He still vividly remembers the colorsof the Caribbean during a spacewalk on his second spaceflight (he's flown fourspace missions) when he helped test the emergency jetpack for NASA's currentspacesuits. "The colors of the Caribbean are spectacular anyway,"Lopez-Alegria said. "But seeing that panorama and the Gulf, recognizingthe geography of it, that was quite an experience." After nearly five decades of spacewalks, NASA has racked upa long list of achievements. Among those are: The most people on a spacewalk (3 astronauts? they plucked an ailing free-flying satellite from space in 1992);unprecedented repairs to spacecraft like Hubble, vital space station servicing(Skylab in the 1970s and now the International Space Station) and internationalcooperation. Spacewalkers literally saved Skylab,the first U.S. space station, after its launch left it crippled with a missingsolar array and exterior damage, Lutz said. Astronauts helped free Skylab'sremaining solar panel and set up a parasol to shield it from the sun. "So that was a pretty big one as far as EVAs go,"Lutz said. "They're all pretty amazing." With NASA's space shuttle program retiring this year and theability to ship bulky gear up to the space station going out with it, theagency will be left without a way to return its current spacesuits to Earth forsafekeeping, Pearlman of collectSPACE.com said. Some may be discarded to burnup in Earth's atmosphere, while the rest may be kept in reserve to serve asspares or for parts. "Unfortunately, the EMU may be the only spacesuit todate in U.S. history that will not have a flown representative inmuseums," Pearlman said. NASA's future missions may send astronauts to visit anasteroid, Mars or the moon, which will require new spacesuits designed forsurface work. Lopez-Alegria, Lutz and McBarron believe that moreflexibility and dexterity will be vital for those spacesuits to perform, butthe final design will depend on NASA's ultimate destination. "I think the mission use dictate the requirements thatthe suits will have to meet," McBarron said. ? "If you go back to themoon you'll find you need suits that can walk."